This is a simple tool that allows you to quickly calculate the best matching standard resistor values, from set of standard values, for desired output voltage of LM317 voltage regulator. Just enter the output voltage you want, and the tool will show you the best fitting pair, along with the actual output voltage using the given values. 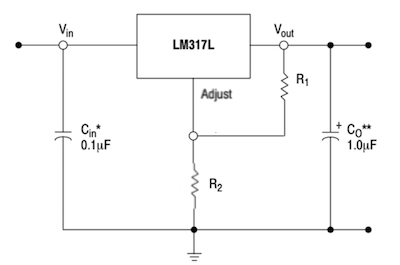 Pinouts for LM317T in TO-220 package, and LM317L in TO-92 package are shown below for convenience.